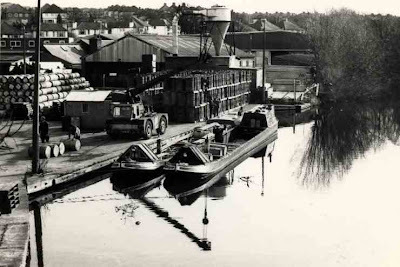 Boxmoor Wharf Hemel Hempstead has to me like many others always been the Lime juice dock. 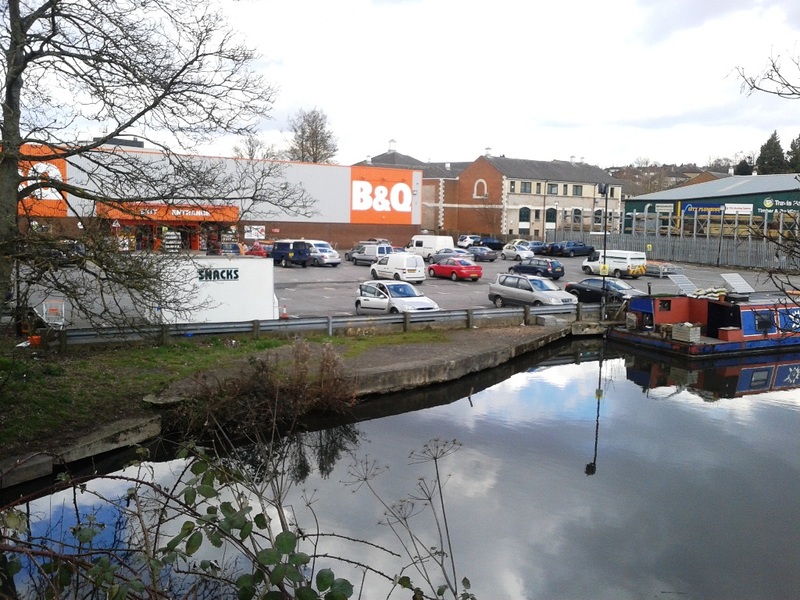 I remember living in Watford and driving to Hemel passing the mountainous stacks of Oak barrels just where BQ is today. Coming over the canal bridge and driving along the side of the dock into town barrels towered above you. In the hot weather they were sprayed with water probably to stop the Oak barrels shrinking and leaking. Thousands of them brought up from Brentford by boat and then shipped to St. Albans for bottling. It is stated the trip took 12 hours. 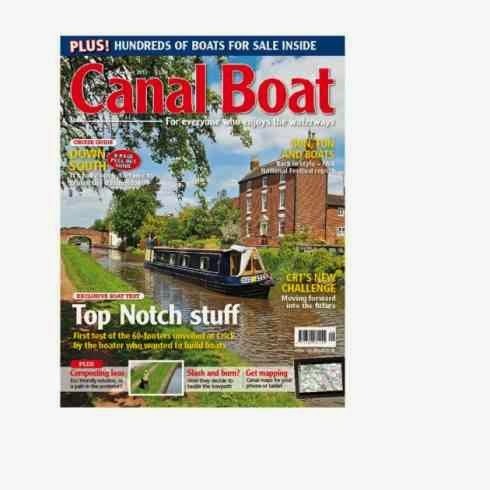 Canal plan states 27 miles 36 locks 17 hours. Boy would I have liked to be aboard and watch the old boatmen knock 5 hours off. 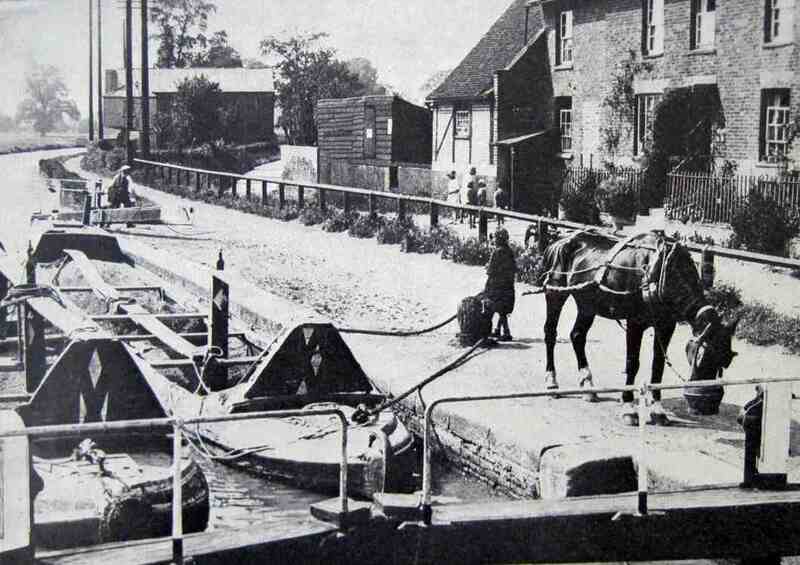 If the canal branch from Cassio had been built the barrels might have been shipped direct into St. Albans. The wharf is owned by the Boxmoor Trust who built it following the sale of 25 acres of common land for£900 ($1400) so the canal could be built. Now all I have read says they built it but I believe they only built the warehouses and other buildings as in the 3rd picture down. 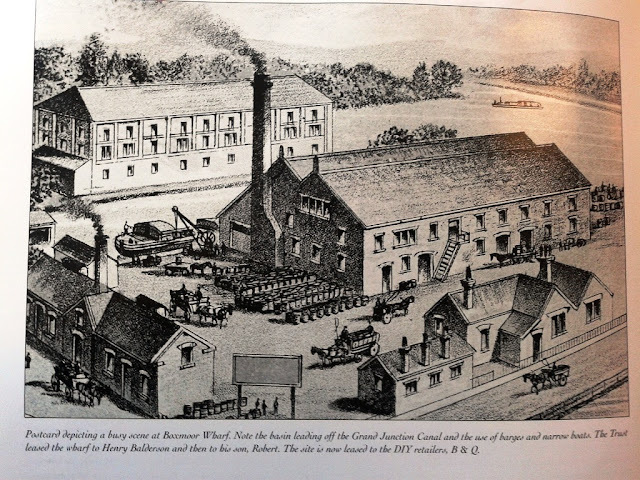 I did find reference to the canal company having allowed for the basic wharf side in the original plans but could not find any more details other than from memory it was to do with a timber mill. Balderson a dealer in coal, stone, timber and the import of wines had a lease on the wharf in 1856. By 1890 his son Henry had negotiated a lease of £100 ($150) per year. BQ ( Home Depot to U.S. readers) came along in 1984 paying £50,000($75,000) and onto 1995 £300,000($450,000) In the early years they had a reduced rent owing to a deal with the Boxmoor trust as to the buildings construction by BQ. Last years accounts show the rent was £480,970 and the building reverts back to the trust if BQ give up the lease. 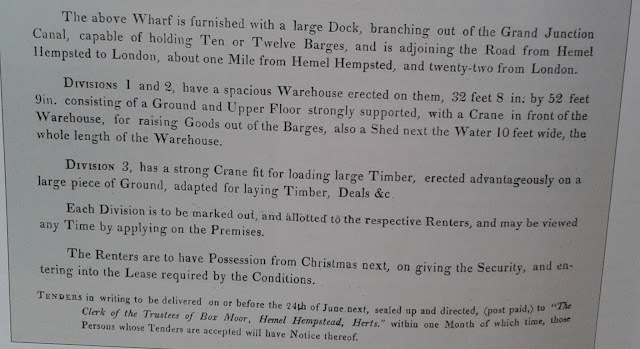 A poster(section above) advertising the wharf refers to it being able to hold 10 or 12 barges! It mentions the present occupier to be Howard and sons who I found held a lease in 1818 so I assume it is around this date the lease is being advertised. The old ordnance map shows the two wharves. 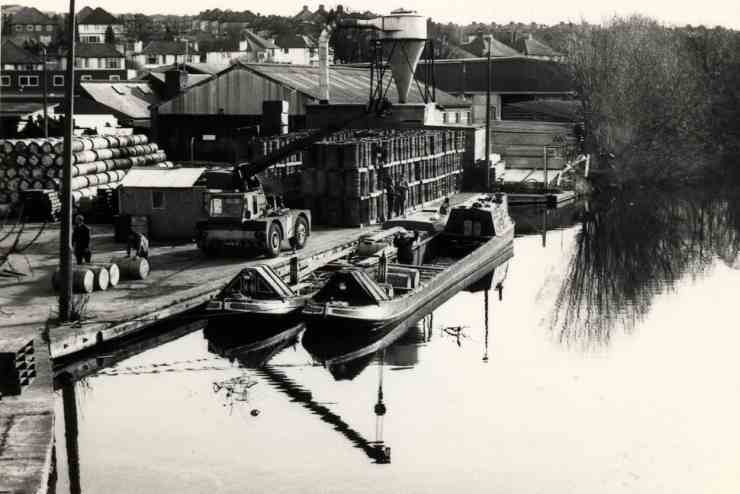 The one on the right was occupied by W. H. Lavers timber and still is today under the name Travis Perkins. 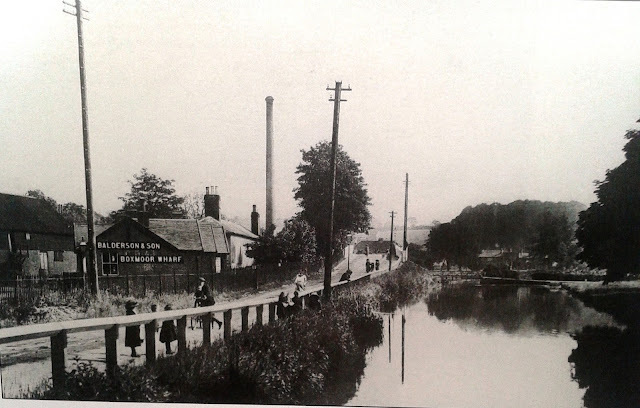 Lavers were at Fishery wharf near the pub/lock of the same name back in 1869 and moved to Boxmoor in 1870 for larger premises. They had timber brought by boat from London docks and processed it in their own steam mill on site. Now this is the swing bridge over the R. Gade. At first I was confused because I assumed the bridge crossed the Gade on the canals offside which made the bridge seem in the wrong place. 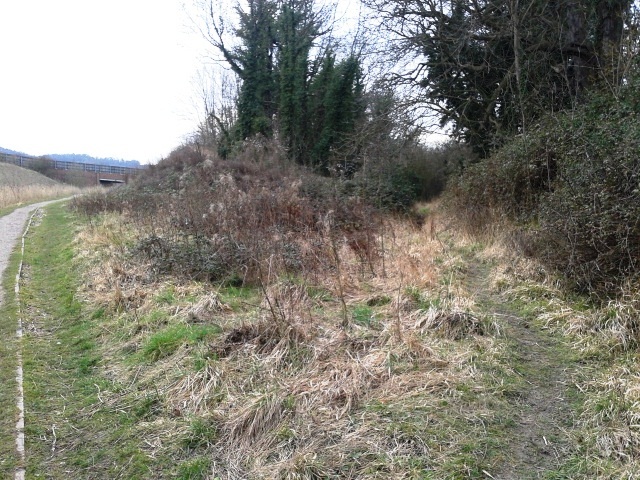 But further reading and digging out the map above I realised the Gade ran straight through the present day towpath. BQ is just under the road bridge. Just to the left of this picture is Boxmoor lock 64 the start of the long pound stretching over one and a half miles to the next lock. 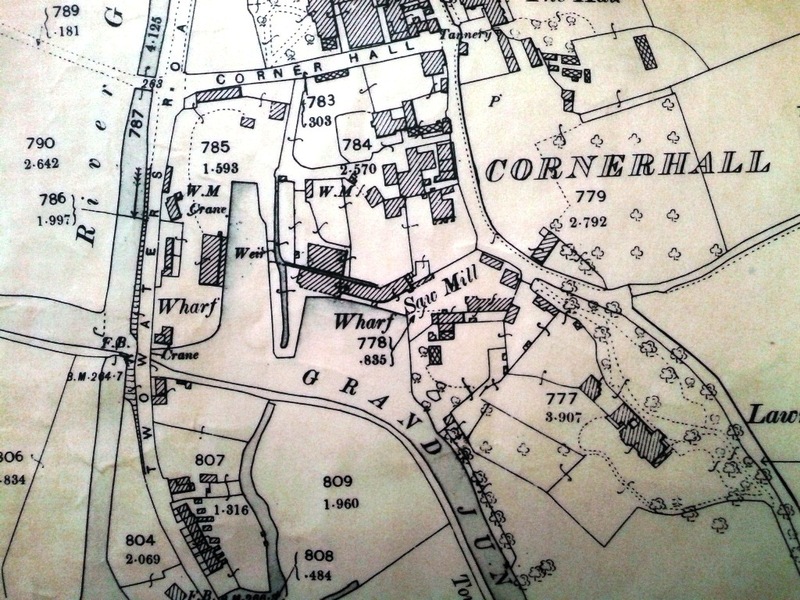 This was of course before the canals present route came about in 1819. Modern day pictures are my own. The map is from the library collection and photographed by me. It is beyond the 50 year copyright rule that enabled me to copy it. 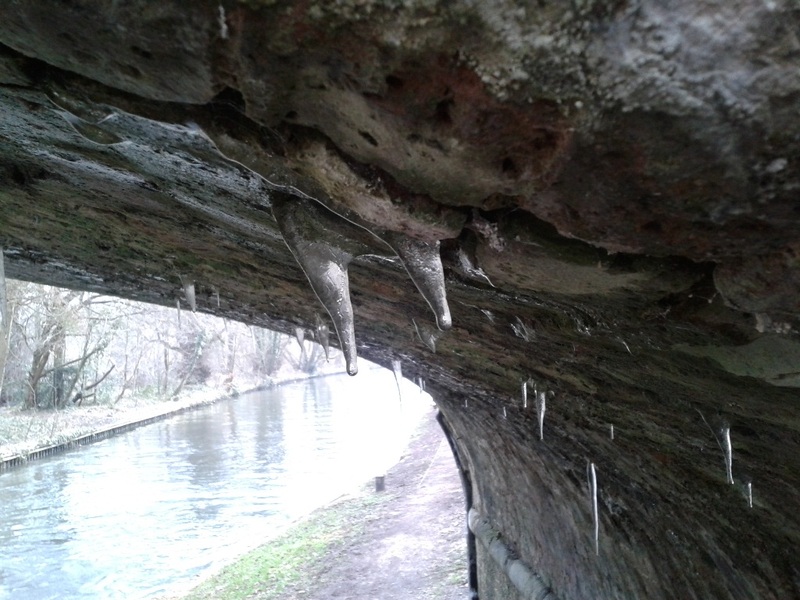 Coming out of a lock and going under the adjacent bridge I noticed the Icicles hanging from the brickwork. 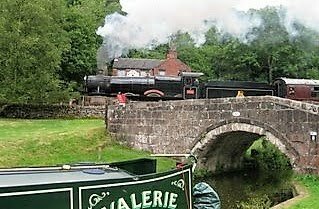 Now we both remember March a year ago we were on the Shropshire Union below Audlem sitting in the hot sun that lasted about 5 days. 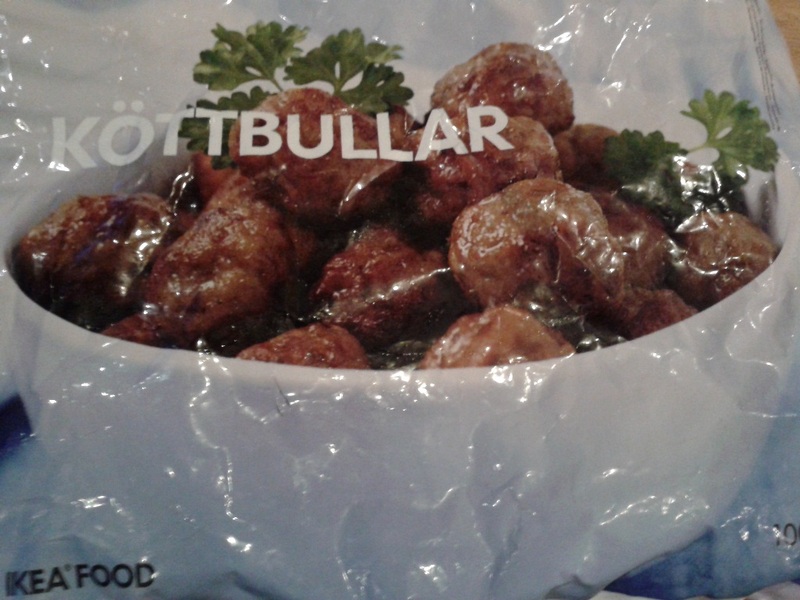 Now the packet to the left is Ikea meat balls. 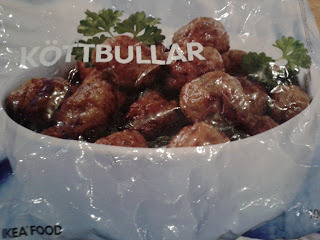 Mmmm been in our freezer long before the press kicked up the horse meat scandal. We had some before that event and we have just had some this evening. So if they do contain gee gee meat then all we can say is we like it. It all makes me wonder how long have we been eating cowboy transport. The only thing wrong as Jaq says is the fraud of charging for something different to what you believe your getting. Oh well we still have some for another day. Maybe Tesco will bring out joints of horse meat and change our Sunday roast for ever. 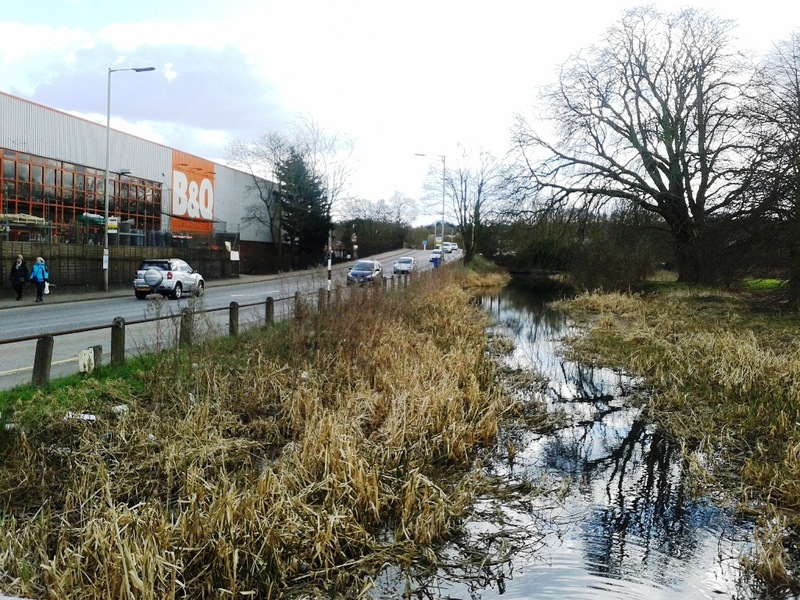 The canal passes Hemel Hempstead within a 10 minute walk to the town centre. The building in the picture is the old Kodak HQ building built in 1971. It has had some extra floors added to the original 22 and is now been converted to approximately 430 apartments. 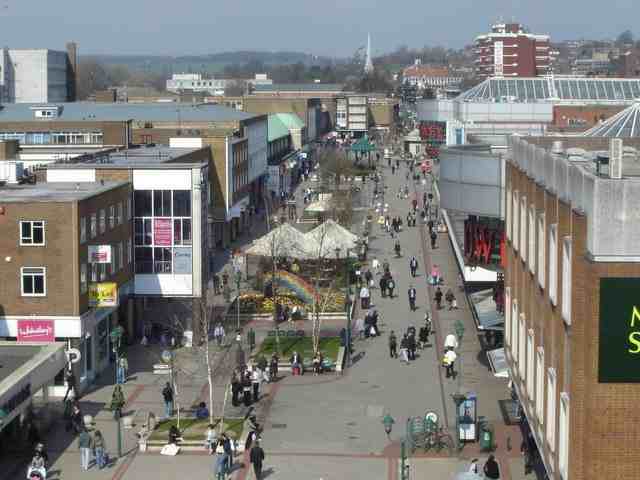 The main shopping centre of Hemel is very close to the building. We are heading a bit further on as the moorings here are not very good. While moored in Bourne End we travelled in on the bus to Hemel it was here in the town i got my jolt or perhaps you might call it a "wake up look what`s happening" moment. Even a Wow! it is true realisation. Hemel Hempstead is a sizable town of about 85,000 with a large industrial area. It is adjacent to the motorway (freeway) system and just 23 miles or 30 train minutes from London. The shock was seeing in the Marlowes shopping centre (mall) 12 empty stores from a total of about 70. Walking along the main shopping street outside also had many shops that had ceased trading. Now living the life we do and not being part of the country`s workforce or an owner of a land based residence and having limited knowledge of press and TV news it did hit me to see this. Yes I am aware of the financial crisis and have seen some pretty run down towns on our travels, Rugely springs to mind, but to see this happening to a town of this size close to the capital was a shock. Understanding why the shops are closing is not hard when looking on line I see rents of £82,500 plus £19,000 business taxes per annum for 997 square feet. US readers just add 50% and you are near enough in dollars. You need a lot of customers to pay costs like these plus a workforce. So who do we blame for all this? The bankers, government, Internet shopping, the list could be quite long with everybody`s ideas. I have no idea but feel bloody depressed writing this having had one of the grandchildren on the boat over the weekend because for sure they are the ones in the firing line if it`s not brought under control. I will stop here because I`ll be onto the EU club, you know the one where some(all of Europe) can take what they want without making a contribution and the other members(uk) will go without or end up working longer to plug the hole in the finances. Anyway this boating way of life does shield us from a lot of the stresses of living ashore. Fuel and food are our main costs which compared to shore dwellers other expenses is not to bad. At least we have no mortgage on a large property that needs heating. Fuel bills for a house have reached high levels since Nb Valerie started floating. Saturday, the only day we buy a paper for the TV guide, I read that the UK only holds 20 days stock of gas(propane) and now supplies are in short supply and there could be a shutdown of gas supplies to homes. Because of our connection to the U.S. I will mention the U.S. holds 6 months of stock. What happened to this country that once ruled a big chunk of the world that we are more and more being controlled by foreign companies. German, French and Spanish companies control the biggest slice of our energy supplies. I remember as a kid growing up in Paddington the Gas company was North Thames Gas Board and the leccy was London Electricity Board. Water was Thames Water Co. Now it`s gone from German hands to Australia. Article HERE mentions energy in the U.S. as well as the UK. So if you can`t cook or heat your homes don`t worry because you will be able to use HS2 and get to the midlands a few minutes quicker. Do we in the UK really need to spend billions of £`s, double what they say now because you know it will cost double in the end. The UK is a small island do we need 225mph trains? The fuel on board the boat is diesel and at a lower cost than road diesel it gives us not only the ability to move the boat but also provides hot water and electricity from each unit of diesel. Most of our heat is provided by wood gathered from fallen trees as we travel. All in all there is less stress afloat even in retirement. Ok rant over, sorry but it just peeves me to see what a state this country is getting into. But don`t despair if all else fails you can take to drink now tax on a pint of beer has been cut by 1p. All that does is reduce tax receipts ( the things that reduce the national debt) although if you drink 4 pints per night you will be 28p a week better off so I can see now what a sensible decision our government made there. Thousands all over the country will be dancing in the streets. Back to life afloat. 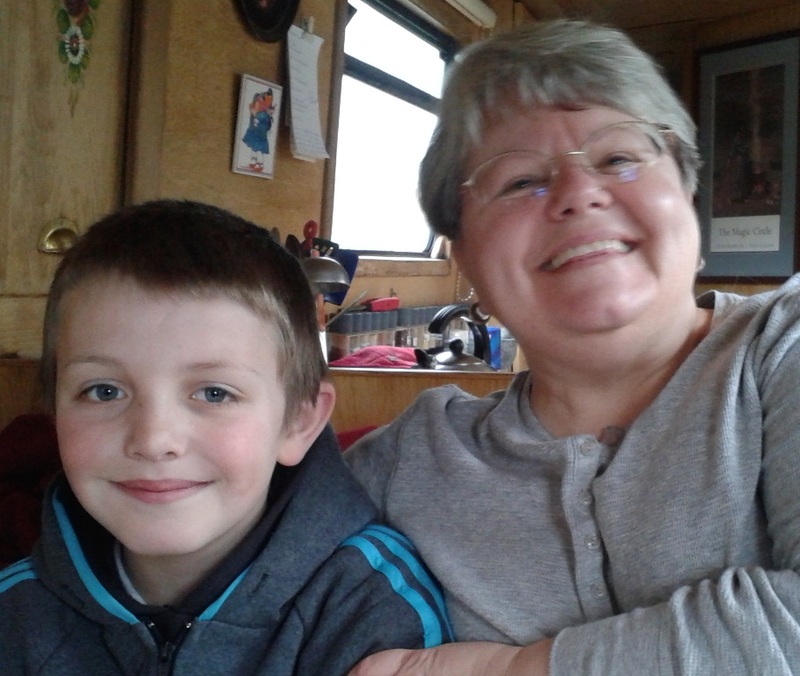 Today Karen and Ian Nb Tacet stopped off for tea and chat on their way down to London. Have to use an old pic as is usual spent time catching up and forgot to get the camera out. The photo was taken on the Bridgewater canal last April. 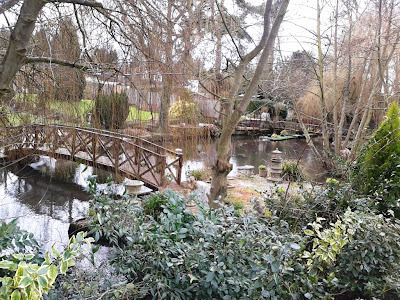 Jaq and I had a walk into Kings Langley the other day, who knows or cares which day, and spent 3 hours because we could/wanted reading history of the area. Never in my dreams did I imagine life could be so good in retirement. the water source for Cress beds along much of it`s course. It merges with the canal in places and joins the River Gade at Hemel Hempstead. Next obstacle for cap`n Jaq is Winkwell swing bridge carrying a single track lane across the canal. It probably takes 5 minutes for the whole sequence to swing the electrically operated bridge but for sure small as this lane is it never ceases to amaze me the number of cars that end up queuing to get across. 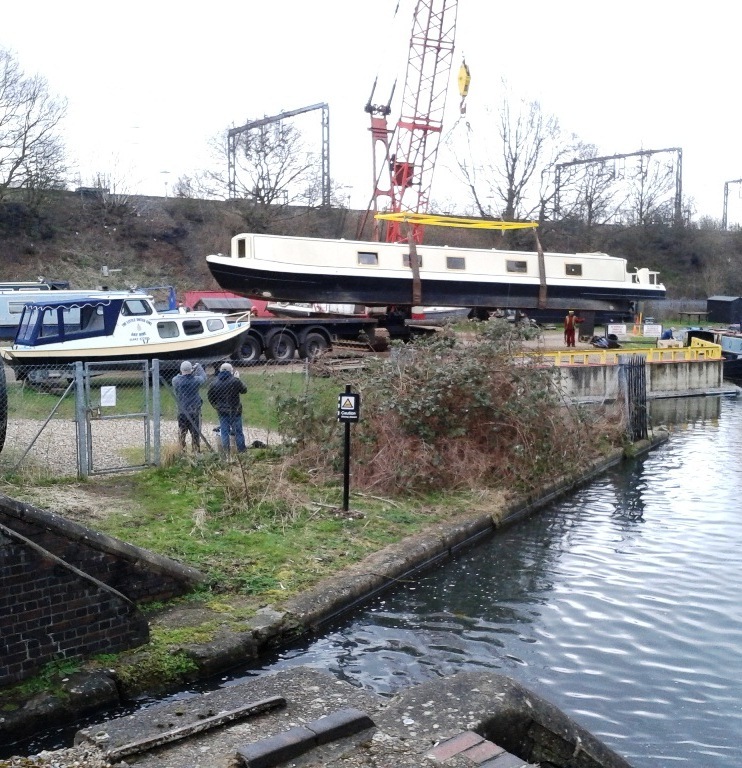 A new build wide beam is being craned in as we arrive at the next lock. Being very quiet with little boat movement we spent a while in the lock watching with interest. You notice the Yellow barriers around the launch area well they are in case they drive the crane into the canal for a second time! and into the water it goes. This is the winding(turning) hole just next to the marina. I`m thinking the marina owner has clarified the location with Red signage probably fed up with boats turning in front of the marina moorings. A modern day before and after. The old Bridgewater boats hire base has been re-developed. Many plans were turned down before they were allowed a 4 bed house, a boat house and two other smaller houses to the right of picture. I did wonder if the house owner has a boat in the dock or even if it is in fact part of the house sale. Down past Topside lock I have always liked these cottages even more now they have had a lick of paint. Plenty of water as the flooded towpath shows. Water is pouring over the top gates at most of the locks. We headed for a favourite, in this area, mooring close to bridge 146 that is opposite a field of horses. 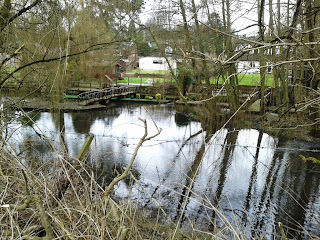 A walk up the lane gives access to buses into Hemel Hempstead so this mooring suited us for a few days. I do remember it rained for two days solid so a nice mooring was a must. Setting off from our mooring just beyond the bridge our first lock has as usual water pouring over the top gates and a boat moored on the lock bollards. No signs of anyone on board and as we have been moored nearby I can confirm it has been moored here for 4 days. 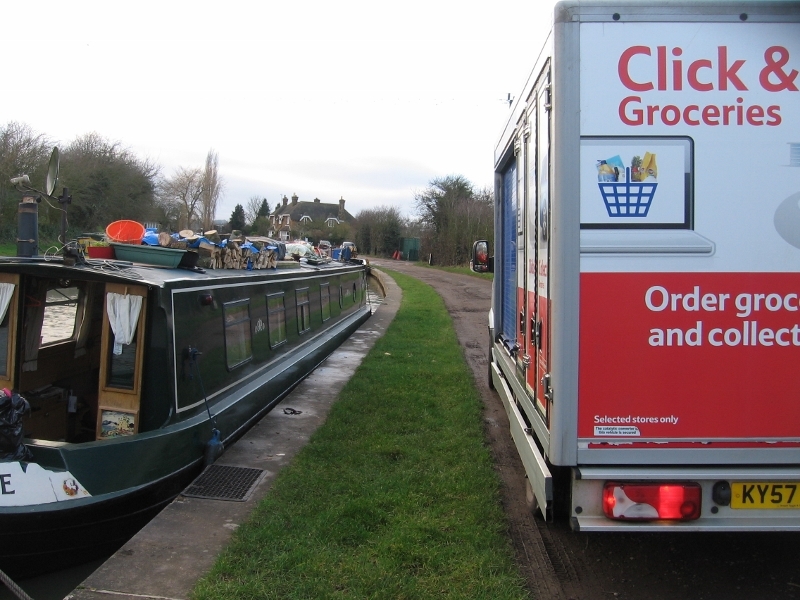 Next stop will be near a road as Jaq wants a Tesco delivery. The picture on the left was a previous delivery that was really close to the boat. This time it was in a road 50 feet away but close enough. The delivery guy was pleased as it was his first boat delivery and he was amazed as he looked in from the front deck. No doubt he told all the other drivers when he got back but i bet he will find another driver has beaten him to being 1st boat delivery. A lot of boaters use the service. To the right on this blog you will notice Les' countdown to his State Pension has wound down to all zeroes! Today Les is 65 years young. 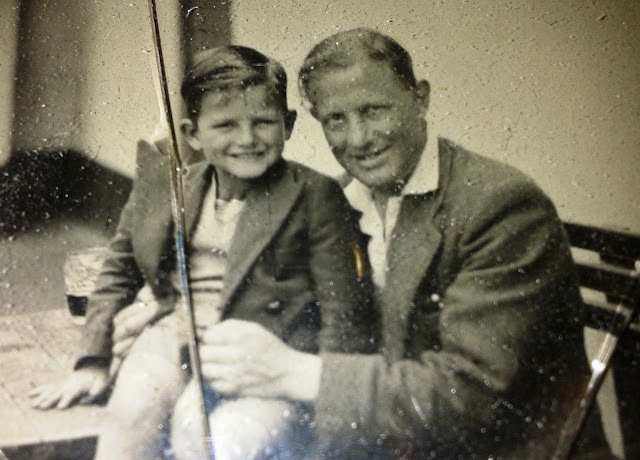 Five year old Les with his dad. This picture was taken at a pub alongside the Thames on Kew Bridge. The photo was taken using wet glass photography--one of the first means of capturing photographic likenesses, it was done with a very large, black camera with a cloth over it, like the one in the picture to the right. This process eventually ends up with the photo adhered to a piece of glass. 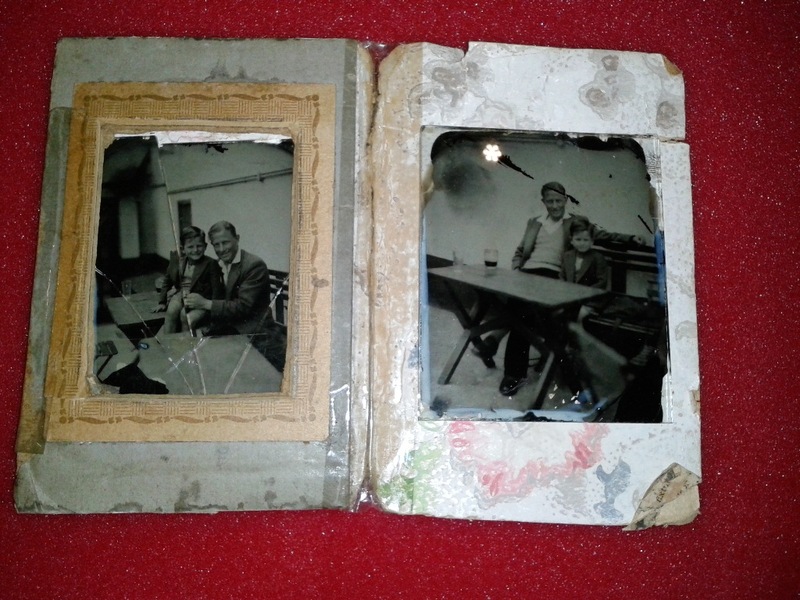 Les' pictures have weathered hard over the years as you can see below, so we were quite pleased to capture a copy with Les' new touch phone camera. Yes, Les is coming to grips with touch phone technology! We started our day with coffee, tea, and birthday cards. Les opened his present while we listened to classic Beatles tunes. At his request a deluxe carrot cake was made with an addition of rum soaked sultanas and pecan bits, frosted with a delicate layer of cream cheese icing. And amazingly enough although Les does not like Chinese food, he loves my homemade Chicken Chow Mein and requested it for his birthday dinner. For a tour of Les' childhood in Paddington, London you can visit an earlier blog post dated Saturday, December 19, 2009. Happy birthday my best beloved. 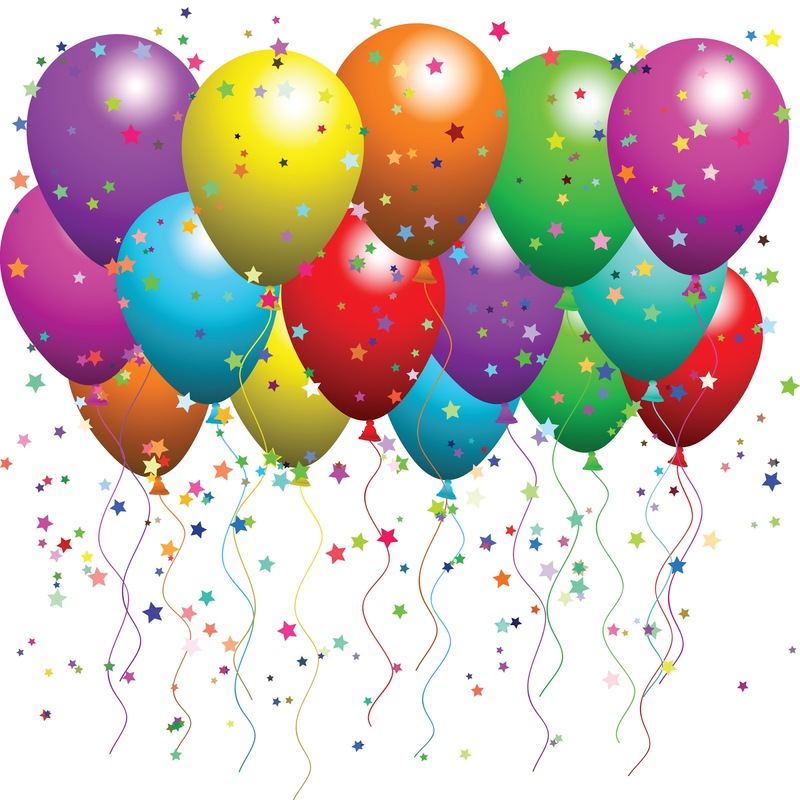 It is lovely to share this day--and this life with you! Recent exchanges with C.& R. T. Serious reading with no pictures. I do not usually e mail any authority be it press, government, BBC(disgruntled Tunbridge Wells) etc. you get the picture. Anyway maybe the coming of age -have you noticed how quick the countdown on the right has gone- has stirred something and as i was so pis annoyed by the mooring notice on the Wendover that I e mailed Canal and River Trust. Notice I don`t actually state how long was our pleasant time although it was hinted in the 3rd line although for the record we admit nothing. I have recently spent a pleasant time on the Wendover Arm. 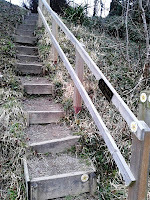 The only suitable place to moor is at the present end of navigation along the concrete edging. I noticed it was 48hrs!! Why? This is a very quiet spot and merits at least 72 hrs and more in winter. Variations of time allowed happens on parts of the system at different times of year. Braunston comes to mind and look how popular that area is yet you allow 14 days over the winter back to 48hrs in summer. Understandable and very sensible. While on the Wendover no other boat tuned up so if busy Braunston has 14 days why not allow more on the Wendover in winter. 2 days in any one visit; 8 days in any one month. So my question is; How does allowing a return to the same mooring 4 times a month encourage continuous moorers to become continuous cruisers? Perhaps if a boat went back and forth between Berkhamsted (7 days, 14 days per month) with a short hop either south or north of the 2 places a continuous moorer would be following your guidlines. The month has gone and it all starts again for the folowing months allowance and all within 9 miles. 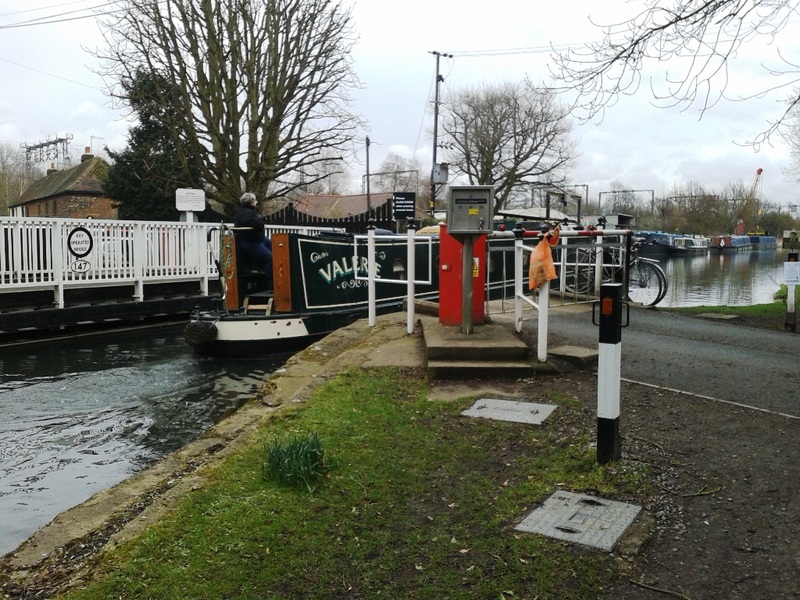 Nb Valerie 513386 http://boatlife.blogspot.com It might be of interest to the readers. Now ok we all know the rules for a continuous cruiser re an ongoing journey passing into a new district etc. but I was annoyed that CRT are giving a reason/excuse for the `non compliant continuous cruisers` or as we call them continuous moorers to spend their time going up and down a small stretch. "well guv i`m just using up my mooring allowance"
I know of boaters that spread their cruising over a good many miles returning to the same area after a decent absence because that is what they need to do. Personally I see no problem there, what gets me is seeing the same boat and pile of junk on the towpath sat in the same place for months on end. Thank you for your email. I have forwarded your enquiry to Julia Moore who is dealing with the Mooring Consultation so should be able to respond to your questions. Ok sounds good, it`s being forwarded on for an answer. Thank you for your e-mail. As you will be aware, we are currently holding a consultation regarding South East visitor mooring sites. The closing date for responses has now passed, but I have asked if your comments could be added to the feedback for review at our workshops next week. No No. I am not asking for a late entry to be accepted via the back door. I really would rather have an answer to my concerns rather than them being reviewed at your workshop. My e mail was not a direct response to your mooring consultation but a concern of what might happen if certain parts of it were instigated and I feel it warrants an answer from someone of a managerial position. I have made a serious point and would rather it not risk being cast aside by a workshop of volunteers unless of course volunteers are now deciding CRT guidelines to cruising. Maybe that will get an answer. The existing behaviours of the worst non movers is certainly not accommodated by these thresholds – also the continuous cruising rules are not only defined by revisit to any one particular location. So if the Wendover Arm trust have proposed the 48hrs and Mr. Whyatt thinks 7 days will be implemented why are the mooring proposals listed in the wording below by CRT? The second paragraph puzzles me. Holiday boaters are usually on a mission, as far and as quick as possible in their 1/2week break so will not be making multiple visits. How does a leisure boater use his 4 times in a month allowance without breaking the C/cruising rules? Point B i`m not sure of. Does it mean that visitor moorings will be less time restricted and therefore CRT can fill them with winter moorings? or is the age thing kicking in again and I`m getting paranoid. Anyway peoples as I have said on here in the past and also on waterway forums the way other boaters read the rules and therefore cruise or not is of no concern of mine. 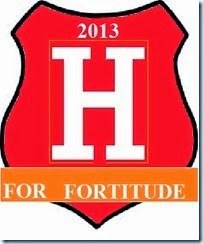 I have been fortunate to have retired early and have no problem complying with the rules. Some may say i`m wrong and should report things from non licensed boats to overstaying but I strongly believe in the saying " there but for the grace of God go i". I know of many folk in circumstances that dictate their cruising habits(work etc.) and I could have been any one of them if my path in life had been different. We have a landlord from whom we rent the use of the waterways from and I believe they should be the ones to enforce the rules. 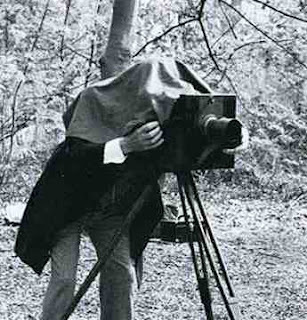 I don`t stand at the side of the road with a speed camera so why should I patrol the towpath? So why then did I bother with the e mail in the first place? Perhaps as I said earlier just an age thing or because I could. Although as I sit moored on a muddy towpath with traffic across the field going by, with housing although set back still not as nice a view as fields. 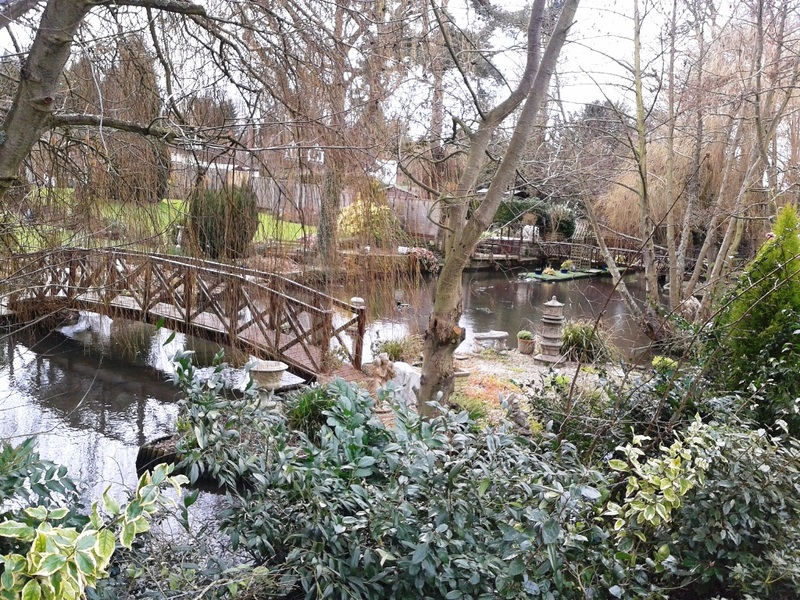 It`s near to a busy town centre, 5 mins walk to pubs and restaurants and the same distance to a train station into London. A very busy place and because of the facilities it`s popular with many boats wishing to moor. So what do they do (CRT) yes correct it`s a 14 day mooring! So even during this time of year you are lucky to find a space and all the moorers are just boaters like us moving within the limits. As always comments welcome even if you think i`m wrong. Just say so politely and as firm as you wish and I will publish your words. Cow Roast and Dudswell locks. Then and now. We spent a couple of days at Cow Roast then decided to move on. As we took on water by the lock I tried to re-create the old picture from the Gerald Massey site. Owing to the private moorings now occupying where the old working boats are moored I am closer but you can see not much has changed over the years. The first of the Dudswell locks No.47, just back around the bend, was a joyful sight with lots of wood to be cut from two fallen trees. Jaq brought the boat up to the lock on the offside and we spent an hour with the chainsaw. Above and below pictures of Dudswell lock 48 on the Grand Union with quite a few years between. The small wooden building has been re-placed by a sturdier looking one. Also in the old picture one of the two buildings further along the lane appears to have been removed. I would guess the horses liked all the locks being so close together as it gave them a lot of breaks from pulling those boats. 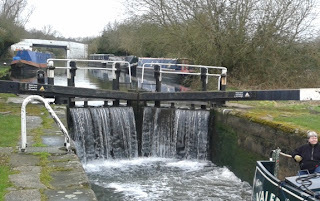 Just a few locks on and we spent 3 days in Berkhamsted after which we needed to seek peace and quiet away from the town but it served it`s purpose with supplies and a few wants loaded aboard. The Wendover Arm was opened in 1797. 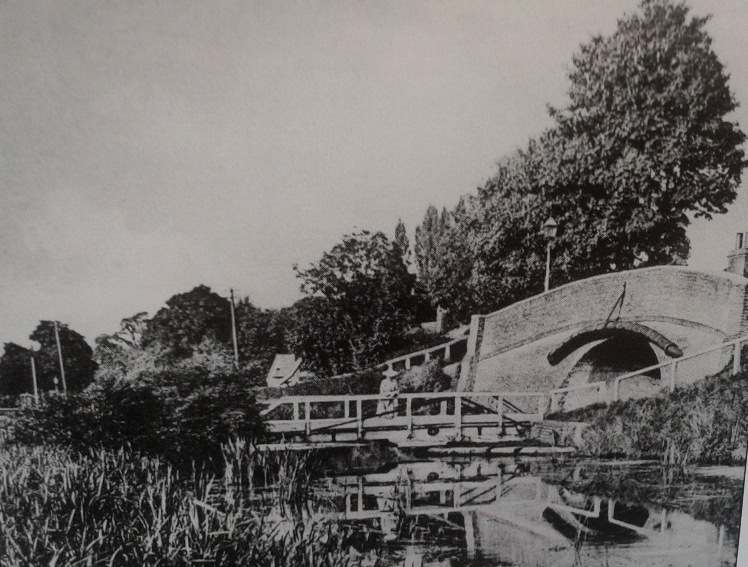 It was originally built as a feeder to bring water from springs at Wendover to the Grand Junction canal main line. 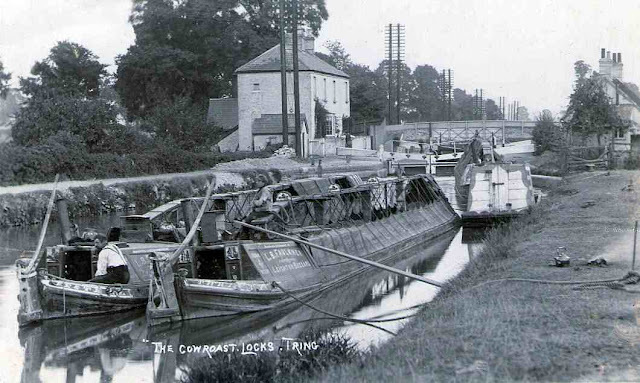 It was decided to make it navigable and was busy serving wharves along it`s 6.5 miles. Many failed attempts to stop leakage ended in the canal being closed to boats in 1897. The Wendover Arm Trust formed in 1989 completed phase one from the stop lock to the present end of navigation in 2005. This included the Little Tring bridge build. This is the winding(turning) point on the Wendover. Straight ahead is filled in and is used as storage by the Trust. It is also the access point for the machinery used in the restoration work. This is the storage/access area used by the trust. Towpath is on the right and the muddy canal bed can be seen. Easy access to this point is from the new bridge at the winding hole just walk past the houses and you will see the entrance a very short distance past the last house. The equipment has to travel through deep mud to reach the work site. The sides are shaped in sections of about 70feet , both sides remember. Next the self sealing Bentomat liner is fixed in place and rolled down the slope. The liner can be seen here on the last section worked on. The liner being laid above is a continuation of this section. The liner comes down both sides and across the canal bed. The bed is then covered as can be seen on the right. Those blocks on top of the earth bed are the bottom course that the concrete bricks are laid upon. 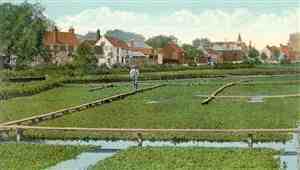 On top of the bricks is laid Coir Rolls to hold up the grassed bank. This is the previous section to that above and you can see the length of the section last completed. A finished section complete with visitor moorings. In this Wendover Trust working party newsletter can be found some interesting figures in the progress report section. Bridge 5. Just beyond this bridge are the steps to the church. The Parish church of St. Mary the Virgin, Drayton Beauchamp restored and partially rebuilt from the previous structures. 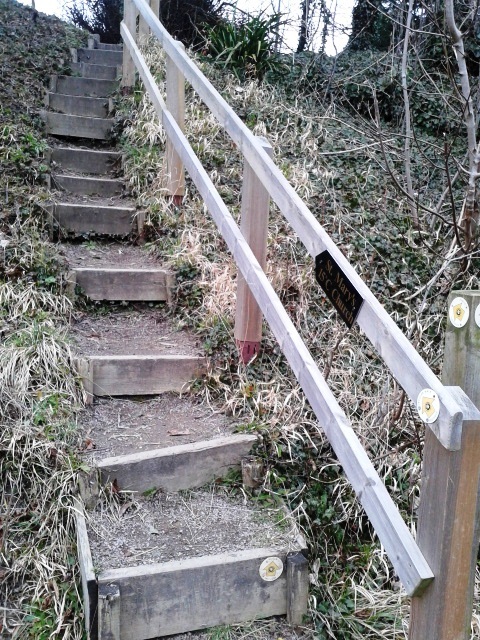 It can be accessed via steps from the towpath. Just past the steps to the church is the point the canal has been re -routed. In the picture on the right the old route is to the right through the trees. Ahead on the left can just be seen the reason for the diversion the bridge carrying the road that by passes the small towns and villages in the area. While constructing the road Saxon graves were unearthed. Just beyond the new bridge the old and new sections merge and a winding hole has been created. Edited Edition of Have You Been Spotted?